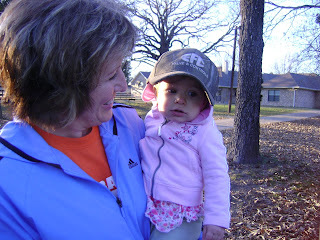 A week before Christmas, we headed down to Texas to spend some extra time with my parents. A couple days after we got there, we went to pick up Staci at the airport. She got to fly down for a week so we made sure to overlap with her so we could all be together. We did a few fun things while we waited for the big day. Avery has to teach Bailey all of the things that you have to do when you go to Nona and Pop's house. For example, you have to dig in the diggy dirt, ride the little bike all around the house as fast as you can, get up at 7:00 and get in the bed with Nona and Pop and watch Mickey Mouse Clubhouse on their TV, play in the button box (well Bailey can't do that one yet, she would definitely eat them. ), and the list goes on and on. 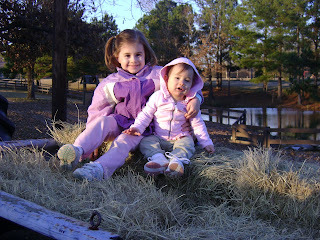 One new thing we did this time that my parents have been meaning to do for Avery for a while was to go on a hayride! My dad hooked up his hillbilly trailer (seriously, it's the pickup bed of an old truck with a trailer hitch added to it--HILLBILLY! If we weren't out in the country where no one could see us, I would be so embarrassed! He does have other real trailers, thankfully. :) Love you, Dad.) 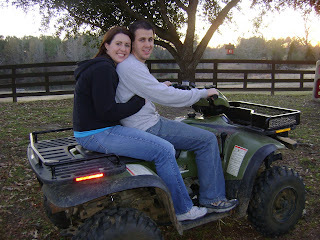 Anyway the hayride was fun and after that, Craig and I got to ride the four wheeler around the land. Craig and Avery usually do this or Craig by himself, but this time I got brave and let Craig take me where he wanted. He went faster than I usually let him, but I will admit--it was pretty fun. Mostly I just like pretending we're teenagers again since we get to sit really close and I am holding onto him for dear life. 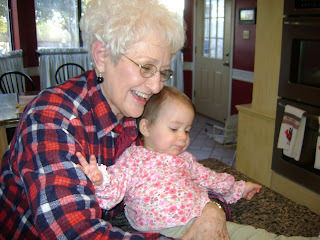 We saw all of my grandparents and they got to love on the girls. We always have the best time at my parents' house, but as usual it goes by WAY too fast! I will tell about the rest of the week in the Christmas post. 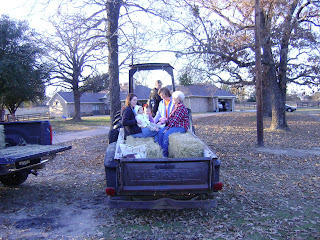 Hayride on the hillbilly trailer. It was pretty cold! 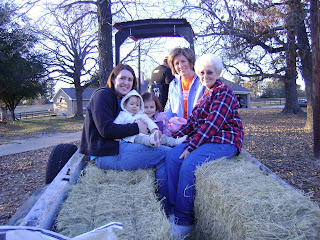 Even Mimi braved it and went on the hayride! 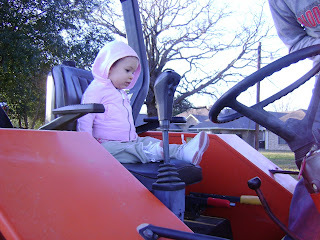 Bailey's first time to sit on Pop's tractor. It's a big deal. It's tradition. Trying on Pop's cap. Can this girl get any cuter? Seriously. 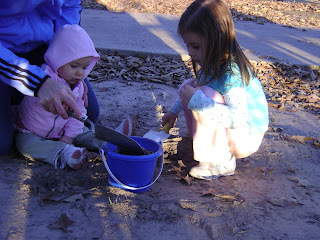 Nona and Avery showing Bailey how to dig in the diggy dirt. 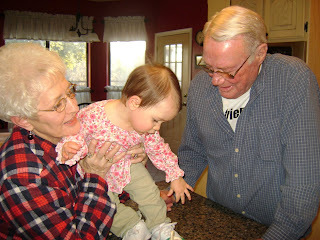 Mimi and Paw-Paw playing with Bailey.